The Deutsche Afrika Korps (best known as simply Afrika Korps) built up a well-deserved reputation as a superb fighting machine. While this was founded on the leadership and tactical genius of its legendary commander Erwin Rommel and the fighting skills of its officers and men, another vital element was its equipment in general and armour in particular. 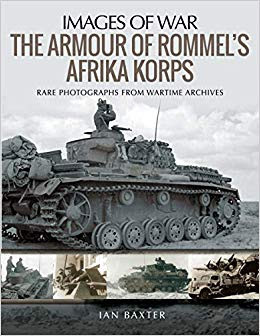 This superbly illustrated Images of War book reveals the full range of German armoured vehicles that saw service in North Africa over the two year period 1941 to mid-1943\. As well as the formidable panzers , such as the Tiger and Panther tanks, there were Sturmartillerie equipments, reconnaissance vehicles, half- tracks, armoured cars, Panzerkampwagens and motor cycles. All had their roles to play. While the Allies triumphed in North Africa ultimately, the combination of German design and engineering with superb generalship and fighting spirit, very nearly changed the course of the Second World War in 1942\. Military historians and equipment enthusiasts will find this a fascinating and authoritative book.